Outstanding seam quality, productivity and operability. A new-generation computer-controlled cycle machine fully equipped with advanced features! The machine runs at a sewing speed of 2,500rpm --- the highest speed achieved in a machine provided with only a medium-sized sewing area. 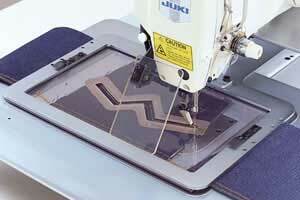 Its jump speed and thread trimming speed are also extremely high, effectively doubling those of conventional machines. With its shortened cycle time, the machine dramatically increases productivity. The direct-drive system offers excellent responsiveness. With its direct-drive machine head (beltless) directly joined to a compact AC servomotor, the machine provides improved responsiveness and upgraded stop accuracy. Vibration and noise are reduced even during high-speed operation, thereby achieving a comfortable working environment. Wider space under the arm and high-precision feed mechanism. Since the X Y feed mechanism is built into the bed, the space under the arm is both increased and flattened. 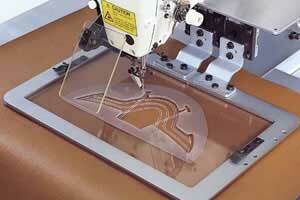 It allows the operator to place sewing products easily. 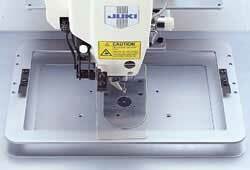 The machine is configured with JUKI’s unique X Y feed mechanism built into the bed. Stabilized by the outstanding strength and rigidity of its feed mechanism, the machine promises the increased feed accuracy required to produce high-quality seams even in difficult sewing processes such as decorative pattern stitching. The hand pulley is installed on the machine arm to enable easy check-up of needle entry and timing between the needle and shuttle hook.  The machine is provided with a needlebar reverse rotating mechanism which allows it to stop with its needle positioned at its highest dead point. This facilitates the placement of heavy-weight fabrics to be sewn. The machine is provided as standard with a double-capacity shuttle hook. By reducing troublesome bobbin-thread replacement works, this feature proves quite helpful when sewing with lower count threads. With its large memory, the machine responds to many different sewing patterns. 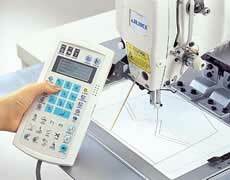 Sewing settings can be established and sewing patterns programmed entirely through the operation panel. Ample storage capacity: maximum of 360,000 stitches on a floppy disk, or 691 patterns on a 2DD disk or 999 ones on a 2HD disk. A maximum of 20,000 stitches can be input per pattern. 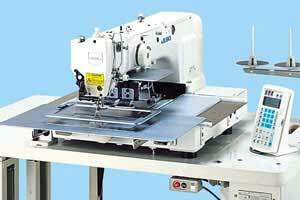 With this large storage capacity, the machine supports embroidery patterns with large numbers of stitches. 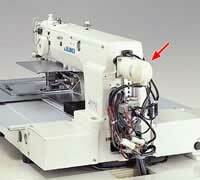 Functions that are frequently used in programming works such as normal sewing (linear sewing and spline sewing), point sewing, jumping, and thread trimming can be allocated to specific keys mounted on the operation panel. The use of these keys reduces the time required for data entry. A sewing pattern can be enlarged/reduced without changing the stitch length. With its side-to-side inverting function, the machine sews a horizontally inverted pattern in the same stitching order sewn before the inversion. This means the original pattern and the inverted one can be finished in the same way, providing the same feeling. The machine reduces the area in which hitch stitches are produced to one-third or less of that produced with conventional machines.